Mount-It! Articulating Full Motion TV Wall Mount Bracket Mount-It! MI-4471 is a durable, low-profile, full-motion articulating TV wall mount that offers extreme versatility with the maximum extension of 15 inches from the wall. It is suitable for Smart TVs such as LCD, Plasma or LED displays that range from 20 to 50 inches, some up to 55 Inches. MI-4471 single arm design is constructed with a high-strength steel for its durability to ensure our arms will not sag and they will provide you the ability swivel 180 degrees and tilt up 12 degrees with ease. This mount offers a sleek, high-tech look, adjustable mounting brackets, a free cable and of the necessary hardware with instructions making this mount user friendly. Features: Fits most of 20-50" TVs Collapses to 3.25" low profile, Extends 15" from the wall. Tilt, Swivel and Extend/Collapse function Easy tilting angle adjustment Heavy duty steel construction and high-tech welding technology Includes all necessary mounting hardware Specifications: * TV Size Range: 20" - 50" (some even up to 55" depending on VESA bolting pattern and the TV weight) * Max TV weight: 66 lbs * Mounting Pattern: Universal and up to VESA 600 x 400. Fits VESA 400X400, 400X300, 400X200, 300X300, 300X200, 200X200, 200X100, 200X150, 100X100, 75X75mm * Tilt: up to 12 degrees down or 2 degrees up and any angle in between. Swivel: 90 degrees to left or to right * Extension from the wall: between 3.25" to 15"
Universal TV wall mounting bracket design fits most of 20-50" LCD/LED/Plasma TVs on the market (even up to some 55 inch TVs) up to VESA 400x400 and 115lbs (Fits 400X400, 400X300, 400X200, 300X300, 300X200, 200X200, 200X100, 200X150, 100X100, 75X75mm). Please check the VESA (mounting hole pattern behind TV), stud spacing, possible blocked cable/input and your TV weight prior to making purchase decision to determine whether this TV wall mount fits your TV and the installation application. This wall mounting kit is compatible with Samsung, Sony, LG, Sharp, Insignia, Vizio, Haier, Toshiba, Sharp, Element, TCL, Westinghouse 20,22, 24, 26, 30, 32, 40, 42, 48, 49, 50, 51, 52, 55 inch TVs. 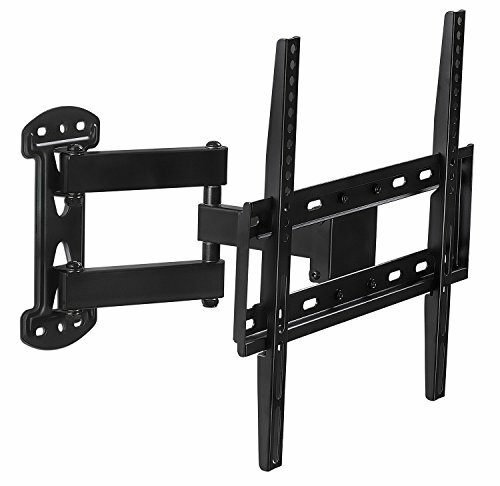 Tilt, Swivel, Articulate, Extend, Collapse with this universal TV wall mounting bracket. Full motion capability makes it ideal for corner installation, over a fireplace, inside a TV center. This slim mount is designed to be installed on a single wall stud. TV stays as close as 3.25" from the wall or can extend up to 15 inches. Swivels left or right 90 degrees.